Back in the summer, in partnership with our survey partner, The Insight Advantage, we surveyed B2B and B2C leaders about their experiences with launches within their companies over the past year. The results that we saw were very consistent with the experiences we’ve seen with our clients here at ThinkResults. The majority of respondents were in high tech, healthcare or consumer goods and in either marketing or management functions and 47% had annual revenues of >$500,000. The most interesting finding of all is the timeline answers. 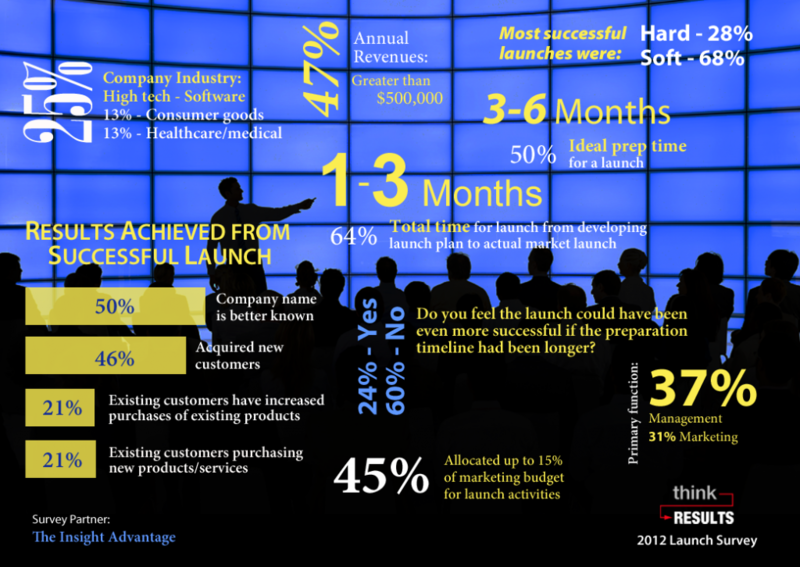 One to three months was the most common timeline for launch (64%), yet 50% said the ideal prep time was three to six months. Even more interesting was that 60% did NOT feel that the launch could have been even more successful if the timeline had been longer. The answers reveal what we see regularly at ThinkResults. The average launch project that is less than three months long is very successful. And very, very hard on the entire team. There is much to do to ensure a successful launch and clients typically underestimate the work required. A launch timeline of three to six months is just as successful but the team (both client and agency) is not pushed as hard. So this is what we think is going on with these discrepancies. Next time, we will include a clarifying question about the impact on the team as it relates to the timeline to see of our analysis is accurate! We are working on the full survey results and plan to release those early in 2013. Contact us if you would like to receive a presentation of those results to help you plan your next launch. Please share this infographic on your blog or social media stream and drop us a comment below if you have any questions.